Frederic Piquionne was the star as Portsmouth put their poor league form to one side to easily qualify for the quarter-finals of the Carling Cup. The much-changed hosts were always in control after Piquionne headed past Steve Simonsen on 17 minutes. The on-loan Lyon striker then turned provider for Danny Webber to cut in and drive home, before stabbing in his side's third after a Simonsen mistake. Kanu added a fourth from close range late on to cap a dominant display. The Carling Cup has provided some welcome relief from a horrendous start to the Premier League season for Portsmouth, and Paul Hart's side can now look forward to a place in the quarter-finals. Tony Pulis had illustrated the Carling Cup's order in his priority list this season by making 10 changes to the side that beat Spurs at the weekend, but Stoke were still surprising lacklustre throughout. Piquionne was one of seven changes for Pompey, but he certainly made a strong case for a starting place against Wigan on Saturday. The French striker opened the scoring by outjumping Danny Higginbotham after a fine cross from Nadir Belhadj. Portsmouth never looked in danger after that point, but had to wait until the 56th minute for Webber to make the game safe with a fine finish from the inside-left channel. Three minutes later and Hart's team were out of sight as Simonsen fumbled a free-kick by Michael Brown into the path of Piquionne who completed the simple tap in. Stoke finally hit the target late on through Tuncay - but the flag went up for offside. And the rout was complete when Aaron Mokoena laid on a sweet pass to fellow substitute Kanu, who rounded the beleaguered Simonsen before slotting home with nine minutes left. "Obviously we need to take a little bit of that into our league performances. The players were determined to put a performance in. "I was pleased to get a clean sheet - the more of those we rack up the better chance we have of winning matches. "And on top of that, the number of chances we created was pleasing." "The four we conceded were very poor goals to give away and were typified by Glenn Whelan falling over the ball for their fourth. "When we got in Pompey's final third there were at least five times where our final ball was absolutely shocking. "If we'd picked people out we'd have had great opportunities ourselves." 90:00+2:04 The game is over, as the referee blows his whistle. 90:00+1:10 Nwankwo Kanu has an effort at goal from the edge of the area that misses to the right of the target. 88:34 Booking Andy Griffin receives a yellow card. 88:27 Nadir Belhadj fouled by Andy Griffin, the ref awards a free kick. Marc Wilson restarts play with the free kick. 85:40 Foul by Diego Arismendi on Nadir Belhadj, free kick awarded. Michael Brown restarts play with the free kick. 83:32 Free kick crossed by Glenn Whelan, clearance made by Younes Kaboul. 83:32 Booking The referee books Marc Wilson for unsporting behaviour. 83:21 Louis Moult fouled by Marc Wilson, the ref awards a free kick. 81:55 Substitution (Stoke) makes a substitution, with Louis Moult coming on for Tuncay Sanli. 80:47 Assist on the goal came from Aaron Mokoena. 80:47 GOAL - Nwankwo Kanu:Portsmouth 4 - 0 Stoke A goal is scored by Nwankwo Kanu from close range low into the middle of the goal. Portsmouth 4-0 Stoke. 77:46 Inswinging corner taken by Michael Tonge from the left by-line played to the near post, clearance made by Nwankwo Kanu. 77:39 Andy Griffin delivers the ball, Hayden Mullins manages to make a clearance. 75:57 Direct free kick taken by Glenn Whelan. 75:57 Substitution Richard Hughes on for Aruna Dindane. 75:57 Aaron Mokoena concedes a free kick for a foul on Mamady Sidibe. 75:37 Frederic Piquionne takes a shot. Save by Steve Simonsen. 75:07 Hayden Mullins gives away a free kick for an unfair challenge on Michael Tonge. Michael Tonge takes the direct free kick. 74:28 Substitution Liam Lawrence leaves the field to be replaced by Tom Soares. 74:11 Shot by Liam Lawrence from outside the box goes over the target. 72:47 Outswinging corner taken right-footed by Michael Brown from the right by-line to the near post, Glenn Whelan manages to make a clearance. 70:33 The assistant referee signals for offside against Nwankwo Kanu. Steve Simonsen takes the free kick. 70:06 Tuncay Sanli is caught offside. Indirect free kick taken by Jamie Ashdown. 68:59 Danny Pugh takes a shot. 68:26 Inswinging corner taken right-footed by Liam Lawrence played to the near post, clearance made by Nwankwo Kanu. 67:32 Substitution Danny Webber goes off and Nwankwo Kanu comes on. 64:11 The referee blows for offside. Danny Higginbotham restarts play with the free kick. 62:46 Marc Wilson restarts play with the free kick. 62:46 Substitution Aaron Mokoena joins the action as a substitute, replacing Hassan Yebda. 62:46 Booking Booking for Michael Tonge for unsporting behaviour. 62:38 Michael Tonge concedes a free kick for a foul on Aruna Dindane. 62:00 Corner taken right-footed by Liam Lawrence from the left by-line, clearance by Nadir Belhadj. 58:43 Assist by Michael Brown. 58:43 GOAL - Frederic Piquionne:Portsmouth 3 - 0 Stoke Frederic Piquionne gets on the score sheet with a goal from inside the six-yard box to the bottom right corner of the goal. Portsmouth 3-0 Stoke. 54:58 The assist for the goal came from Frederic Piquionne. 54:58 GOAL - Danny Webber:Portsmouth 2 - 0 Stoke Danny Webber fires in a goal from just inside the penalty area to the bottom left corner of the goal. Portsmouth 2-0 Stoke. 54:06 Substitution Mamady Sidibe joins the action as a substitute, replacing Dave Kitson. 53:38 Foul by Aruna Dindane on Andy Griffin, free kick awarded. Direct free kick taken by Liam Lawrence. 49:55 A cross is delivered by Anthony Vanden Borre, Leon Cort makes a clearance. 48:35 Inswinging corner taken right-footed by Michael Brown played to the near post, Steve Simonsen makes a comfortable save. 46:18 Shot from just outside the box by Glenn Whelan goes over the bar. 45:00+1:03 The ref blows to end the first period. 44:28 The assistant referee signals for offside against Dave Kitson. Jamie Ashdown takes the free kick. 42:25 Shot from just outside the penalty area by Michael Brown misses to the left of the target. 41:21 Free kick awarded for a foul by Aruna Dindane on Andy Griffin. Liam Lawrence crosses the ball in from the free kick, clearance by Hayden Mullins. 40:17 Danny Pugh produces a cross, save by Jamie Ashdown. 39:00 Shot by Frederic Piquionne from a long way out goes over the crossbar. 38:04 Shot from just outside the area by Liam Lawrence goes over the bar. 36:19 Effort from deep inside the area by Frederic Piquionne clears the bar. 34:40 Unfair challenge on Aruna Dindane by Andy Griffin results in a free kick. Jamie Ashdown restarts play with the free kick. 33:25 The ball is sent over by Andy Griffin. 32:06 Glenn Whelan concedes a free kick for a foul on Michael Brown. Younes Kaboul takes the direct free kick. 29:02 Danny Webber takes a shot. Save made by Steve Simonsen. 25:10 Liam Lawrence has an effort at goal from long range that misses to the right of the target. 23:41 Danny Pugh produces a cross, clearance by Hayden Mullins. 23:19 Anthony Vanden Borre concedes a free kick for a foul on Tuncay Sanli. Danny Higginbotham restarts play with the free kick. 21:03 Frederic Piquionne produces a left-footed shot from outside the penalty area and misses left. 16:08 Assist on the goal came from Nadir Belhadj. 16:08 GOAL - Frederic Piquionne:Portsmouth 1 - 0 Stoke Frederic Piquionne scores a headed goal from inside the penalty box. 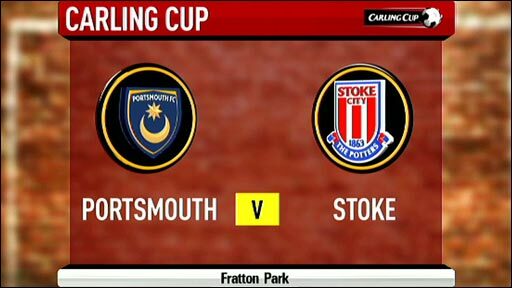 Portsmouth 1-0 Stoke. 14:57 Michael Brown is flagged offside by the assistant referee. Steve Simonsen takes the free kick. 14:25 Corner taken right-footed by Michael Brown. 13:17 Danny Webber is ruled offside. Steve Simonsen takes the indirect free kick. 8:37 Inswinging corner taken right-footed by Michael Brown played to the near post. 8:20 Nadir Belhadj takes a shot. Blocked by Leon Cort. 4:41 Hayden Mullins gives away a free kick for an unfair challenge on Tuncay Sanli. Free kick taken by Danny Higginbotham. 2:17 The offside flag is raised against Tuncay Sanli. Marc Wilson takes the indirect free kick.